We’re looking for a few green thumbs. Interested in growing more than just vegetables this year? Help us grow our Society. To nominate yourself or someone else as a Director on our Board, please download the nomination form and fill it out. 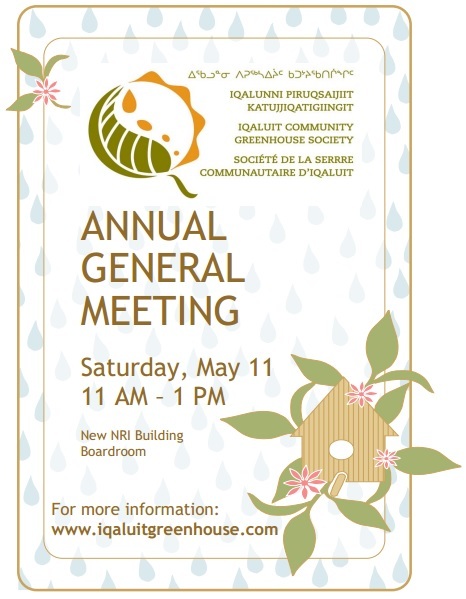 You can scan and e-mail it to us at iqaluitgreenhouse@yahoo.ca with the appropriate signatures, or bring it to our upcoming meeting. It’s our Annual General Meeting this Saturday! We will be sharing the results of our 2013 survey, which will be closing on Friday, May 10 at noon. Please give us your opinions. Be sure to attend. We will be discussing this season’s plans for growing and talking about how you can get involved.